If there's one Christmas tradition I can't get enough of, it's having a stroll around the Christmas markets on a cold, Winter evening. Thankfully, where I live has one of the biggest Christmas markets in the country, therefore as soon as they opened I made plans with my boyfriend to have a little evening stroll around. The markets stretch across the whole of Manchester city centre, from Market Street all the way down to Spinningfields. They're meant to be bigger than ever this year and it certainly feels like it. When it comes to the markets, there's only one thing that my eyes are always drawn to and that's the food and drink! With so many food and drink stalls, it’s impossible not to have a taste of almost everything that the Christmas Markets has to offer (we're committed to making our way round almost everything!) The smells draw you in straight away and I couldn’t help but have a nosy what everyone else was tucking into and what the stalls had to offer this year. Particularly one of my favourites this year was the Spiced Gin. The hot, fruity drink was definitely a hit with me, it was delicious and it was so comforting on a cold, frosty night. Another little treat that I had never tried before was Kaese Spaetzle – German macaroni cheese, a gooey cheese delight with a sprinkle of cooked onions on top. It was delicious and beyond anything I could recreate at home (although I’m going to give it a good go!). There’s something magical about being at the Christmas markets. The atmosphere, the smells and the decorations just put me instantly in a Christmassy mood which I think I’ll now stay in until January 1st. If you thinking about heading to any markets this year, be sure to consider Manchester! 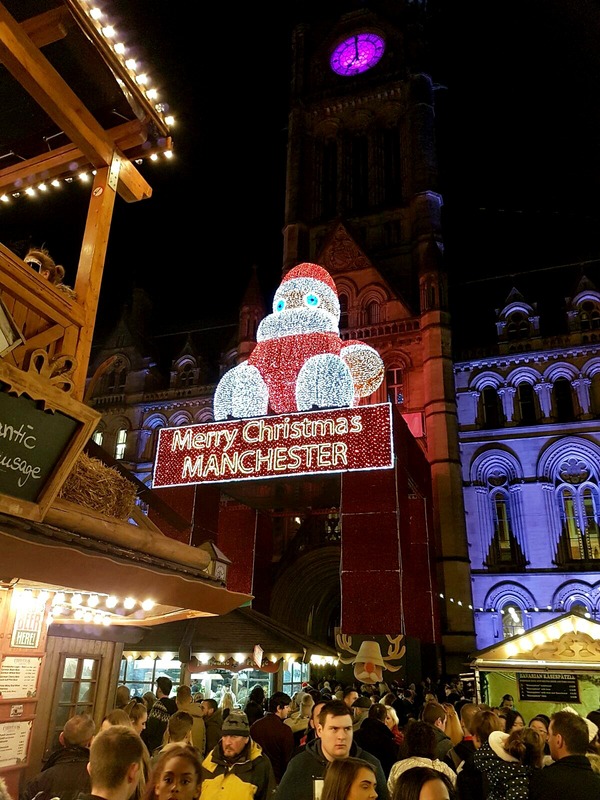 Have you visited the Christmas Markets yet? If you enjoyed this post on Samantha Jayne, you might also like Little Things Lately #16 and Little Things Lately #15.